It's Earth Day again, an occasion on which to reflect on our sins against the environment and make resolutions to clean up our act. We are familiar with the usual suspects: overpopulation, oil companies, overpopulation, chocolate, cattle farmers, the coal industry… and did I mention overpopulation? Well, forget all that. Here's our top 10 eco-villains, most of them getting away with ecological murder to date. 1. Underpopulation. Driven by the myth of overpopulation birth rates around the world, with very few exceptions are falling. Only three Western countries have total fertility rates around 2 per woman ("replacement") and many developing countries are also below that figure. Several countries in Eastern Europe and Asia have a TFR of less than1.4. Nobody knows how to bring the birth rate back to 2 once it has fallen so low. Is this good for the environment? No. Here's why. 2. Big cities. Small families and childless people crowd together in big cities, which gobble up open land and forest, destroy animal habitats, pollute the air and waterways, and create huge waste disposal problems requiring energy intensive solutions. Even where these things are under control, as in the big western capitals, continued growth demands massive infrastructure projects - tunnels, bridges, airports, public transport systems, sewerage… which demand equally massive amounts of raw materials and energy, and have to be periodically renewed. And you only have to look at China and its heavily polluted mega cities to see what the effects of population reduction policies are in the " developing" world . 3. Consumerism. Populations adhering to the small family norm consume more per person. People have more disposable income, which they spend on luxury goods with big environmental impacts: air travel, more powerful cars (because no-one takes the train all the time), multiple household appliances, electronic devices including touchscreens which require rare earth minerals mined from the earth or the ocean floor. People can afford to buy more than they need and they waste more, including food . Even when individuals or families are relatively poor they often emulate the habits of richer citizens and will gamble and go into debt to increase their spending on luxury goods. 4. Solo living. Divorce, delayed marriage and single living have all increased in the era of population explosion panic and widespread birth control. In Europe the number of people living alone has risen by 80 percent over the past 15 years. Widowed older people make up a significant section of singletons but they are perhaps less likely to move in with adult children living in small city dwellings, especially if the family is unstable. Men and women find it harder to commit to each other or to remain committed, and women's increasing financial independence has facilitated break-ups. Also cohabiting couples are more likely to break up than married. Marital or cohabiting break-ups increase the number of people living alone, at least temporarily, and therefore the demand for more housing units and household goods and services. One-person households are the biggest consumers of energy, land and household goods. 5. Big government. Small families and singletons living in big cities are more likely than their more fertile, community-oriented forebears to depend on government to support them in times of difficulty or dependency and to provide for their educational, health and retirement needs. The growth of the welfare state brings with it a vast bureaucracy of people travelling to their offices every day to pull the levers of whatever programme they are administering. Think of their carbon footprint as they commute daily by train or car, and of the meetings and conferences the managerial layer fly to on a regular basis. 6. Coffee. As you can see from the above, there is one original sin, one basic source of villainy against the ecosystem in our era, and it would not be difficult to demonstrate more downstream effects. However, I will mention just one more before turning to other culprits. In the West at least, coffee consumption has increased in inverse proportion to average family size. Besides directly reducing fertility, the daily fix at the cafe is one of the most common things that people throw their spare cash away on when they have two or less little mouths to feed. It is no surprise, then, that this liquid gold is the world's second most tradable commodity after oil (and we know how bad that stuff is), leading to clearing of swathes of forests for the cultivation of sun grown coffee . Sun-cultivation involves deforestation, water pollution, agro-chemical usage, huge amounts of waste, and impoverishment of soils. You could reduce your coffee footprint by looking for a café using the shade-grown variety. Good luck with that. 8. People who don't like being cold (and that's most of us). My candidate for eco-villains are people who don't understand the fundamental basis of population density, and therefore rant about the "problem" that hot countries are crowded and polluted, and all the stuff "we" should do to thin out the crowd. We? Here are a bunch of human population density maps of the world. My country is the big, empty grey area at the top left. 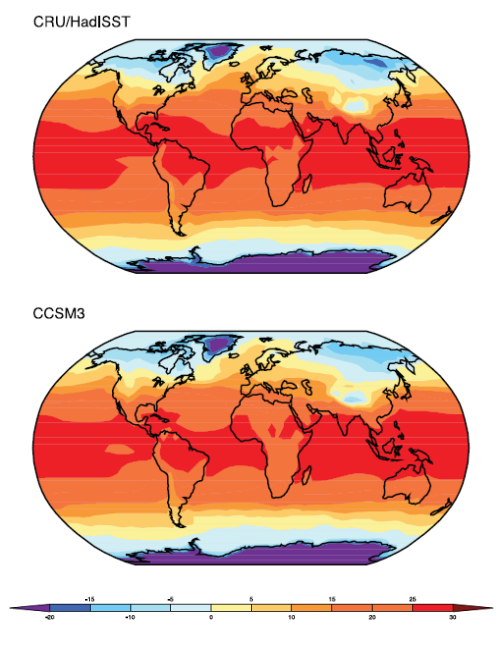 Now here is an average annual temperature range map of the world. My country is the big blue blob at the top left, the unmelted ice cube in your drink. Coincidence? However humans came to exist, one timeless fact is that we like it hot. And humid. We say we don't, but we obviously do. Eco-villains, even things out. Move to northern Canada. Embrace the frozenness. The Chamber of Commerce of Snowdrifts, Yukon Territory, will welcome you with open arms. He loves you. He forgives you. He is really tired of being all alone up there. ~ Denyse O'Leary is a Canadian journalist, author, and blogger.